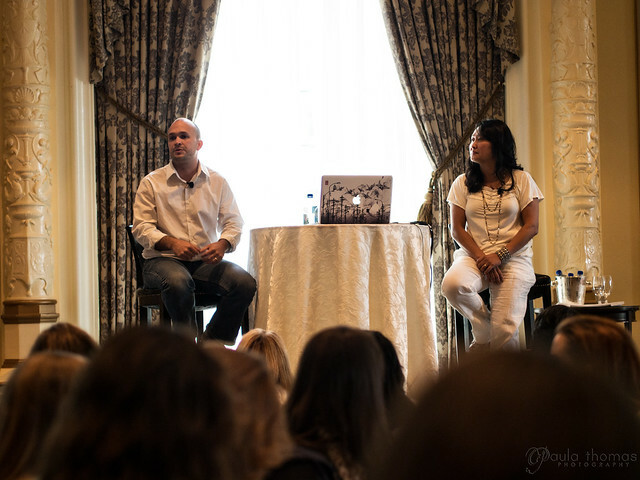 I took last Friday off from work to attend the two day BlogHer Food conference at the lovely Fairmont Olympic Hotel in downtown Seattle. I decided to not pay for parking all day and instead drove to a park and ride in Kirkland and paid $2.50 to take a bus. The bus dropped me off just a block and a half from the front door of the hotel so it was very convenient. 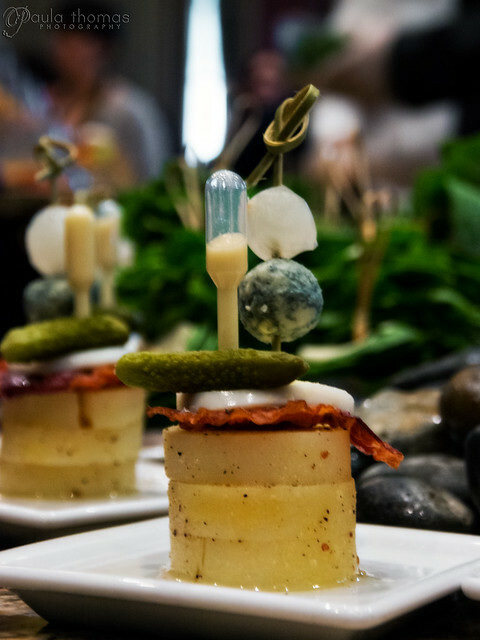 I've been to a similar conference called IFBC (International Food Blogger Conference) that was held in Seattle a few years ago and will be held in Portland this year. 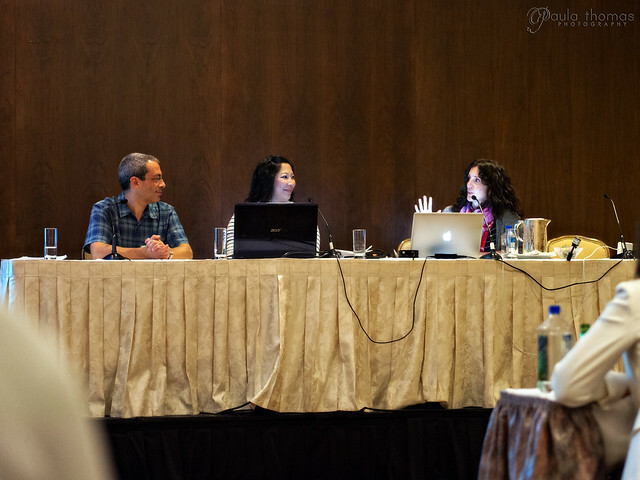 BlogHer was a much bigger conference than IFBC but I'm sure after a few years IFBC has grown too. At BlogHer food we got to choose between 4 different topics at each session. There were three sessions on Friday and two on Saturday. Sometimes the decision on which one to take was easy and other times it was difficult. Friday started with a nice breakfast spread. Even though I had my regular morning shake for breakfast at home, I couldn't resist having a little bacon and eggs when I got to the conference. 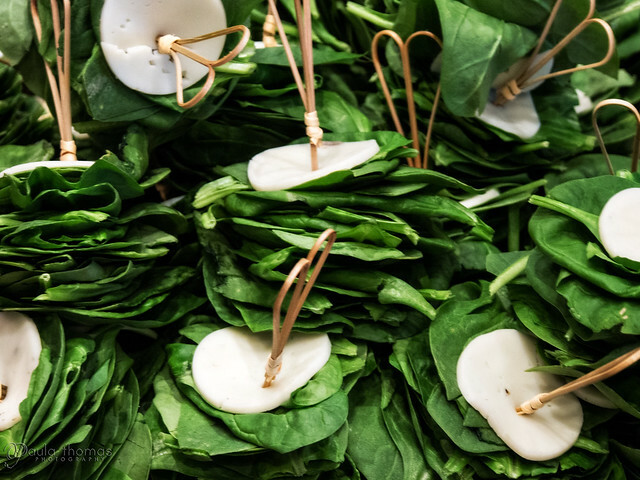 There wasn't much else I could eat because of my candida diet. I brought my bacon, eggs and a cup of herbal tea to the Spanish Ballroom for the opening presentation. Diane Cu and Todd Porter from whiteonricecouple.com gave a "Pioneer Presentation". My favorite quote from their presentation was "Your eyes are your lens. Your heart is your shutter." They showed a few of their videos, one of them was titled "Our Life Recipe" and you can view it on their blog. They spend a lot of time finding the perfect song for their videos and it certainly shows. The whole room got teary eyed when Diane started talking about their dog, Dante. There were some sad stories but also some happy ones, it was the perfect way to open the conference. For the first session I of course decided to go with Food Photography Trends: Beyond Pretty. Anita Chu owner of Desserts First blog and Stephanie Shih owner of Desserts for Breakfast were the presenters. In case you are wondering, Stephanie really does eat desserts for breakfast, I asked her after the presentation. I don't think many people have heard of the word chiaroscuro before, including me. It's an Italian word used in the art world that means "light-dark". I was able to easily identify which style was mine. Product and bold/clean is definitely me. I'm just not very good at using a lot of props in my photos though sometimes I try. 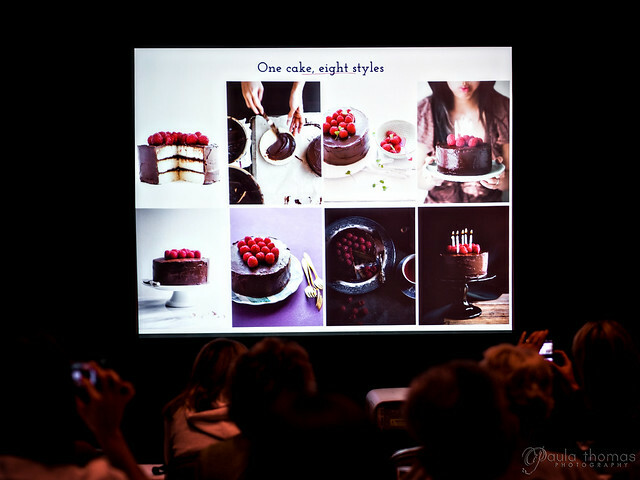 The presentation was centered around a single slide that had 8 differently styled photos of the same chocolate cake to illustrate the different styles. It was really interesting to see the same subject photographed in so many different ways and I was surprised to find out that they were all photographed using natural light. The slide below must have been the most photographed slide at the conference. I saw everyone holding up their phones and cameras to take a picture. Stephanie just posted on her blog yesterday the individual photos from the slide below along with the characteristics of the styles used for each of the shots. It's a great write up and highly recommend checking it out if you didn't get to see the presentation. After the first session we had a break to do some networking and chat up the vendors followed by lunch. They set up lunch in advance, I'm guessing so people could get some great photos of all the great stuff. Not everyone figured it out as i saw a couple people sneaking away with some food before they were ready to serve. After taking several pictures of the lunch offerings I decided to go talk to some of the vendors. I was chatting away and not paying much attention to the food quickly disappearing. By the time I realized it was time to eat, the majority of the food was gone and all that was left were glutinous breads and sandwiches. Luckily I had two breakfast's that morning. I know I wasn't the only one that missed out on the good stuff. Next time be sure to get food first! Here are a few of the dishes I wasn't quick enough to try. For the second session, the one that stood out the most was another photography related one. The topic was How Cookbook Photography Differs from Blog Photography. The panel consisted of 3 blogger/photographers that all published cookbooks. Alice Currah author of Savory Sweet Life, Aran Goyoaga author of Small Plates and Sweet Treats and Michael Natkin author of Herbivoracious. I actually had the privilege of testing Michael's Noodle Salad last year for his cookbook. They talked a lot about what editors look for in cookbook photos. Each of them provided their own experiences with the editors. They all used different editors and publishers so their experiences were all a little different. Alice said how they look at the quality and professional look of the photos and that you need to be open to taking direction. In her experience they didn't want any photos in the cookbook that had been published on her blog or anywhere else. Aran said the quality of light and composition were the most important. That they want to see a variety of composed shots and not the same props, backgrounds and angles repeated in every picture. Michael says you need to have quality photos on your blog to get the editor's attention. Some recommendations for good cookbook photos are to use garnishes and a variety of shooting surfaces to give a variation in backgrounds. Some suggestions for shooting surfaces that you might not normally think of: sidewalks, old sheet pans, a window sill. 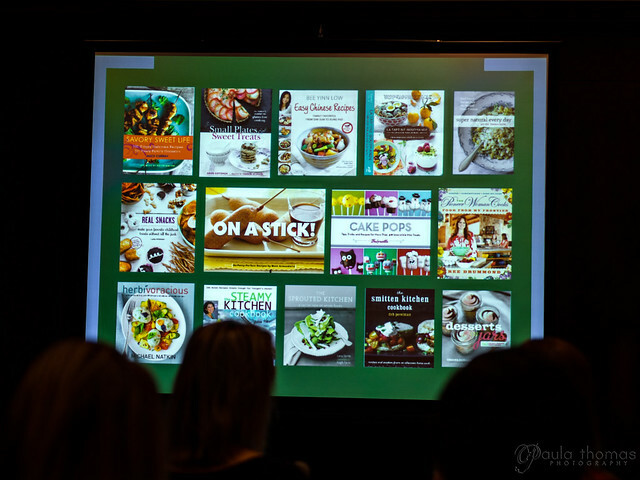 The cover of the cookbook is usually the most controversial thing when developing your cookbook. The cover needs to be something that summarizes the whole cookbook. Even though Michael shot all of the photos in his cookbook, the cover was shot by someone else. If you are going to print your photos be sure to use 300dpi as opposed to 72dpi that is typically used for photos on the web. You need to have a good understanding of color management. SRGB is typically used for web but you will want to use Prophoto or Adobe RGB color space for printing. For session 3 I went with the Build a Career in Food: Beyond Blog Monetization session with Jess Thomson, Lara Ferroni, Melissa Lanz and Tara Austen Weaver. There were lots of different ways to make money from your blog discussed. It is important to identify yourself and create a mission statement. Know who you are and what your voice is and be consistent. The topic of working for free was also discussed and there was a little bit of mixed thoughts on that. I liked this statement "You should only work for free if there is a clear path for opportunity". I'm in the mind set that I would never work for free unless it's for a very close friend or family member or a non-profit organization. I've been asked many times by people through Flickr asking to use my photos for free and I always turn them down. I'm sure they will probably eventually find someone on Flickr that wil allow them to use their photos for free but I'm not one of them. I also get contacted by publishers and advertising agencies that are willing to pay. Sometimes I even turn those down if they offer me less than I think my photos are worth and sometimes they move on and other times they are willing to pay more. The topic of using agents also came up some of the panelists use them and some don't. If you aren't good at negotiating you might want to get one but they made it clear that the agents will not market your book for you and that is something you need to do. 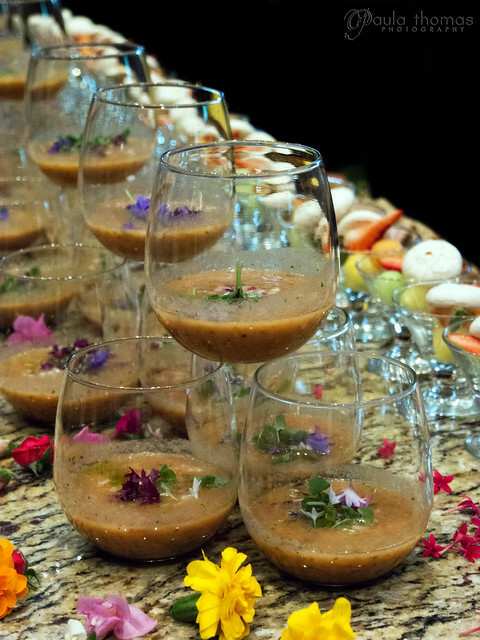 The final presentation on Friday was titled The Intersection of Great Food, Good Health, and Social Justice with Bryant Terry and Terry Walters, interviewed by Elisa Camahort Page. I had the pleasure of meeting Terry Walters last year when she came to Seattle to share her cookbook, Clean Start. These panelists are all about good and healthy food. I thought it interesting that Bryant uses music to inspire his recipes. Terry thinks food should nourish all of your senses. It was recommended that you visit and talk with your local producers. At the end of the first day there was a little welcome reception where some of the vendors were offering drinks and hors d'oeuvres. I couldn't have any of the drinks but I did partake in a few of the appetizers. 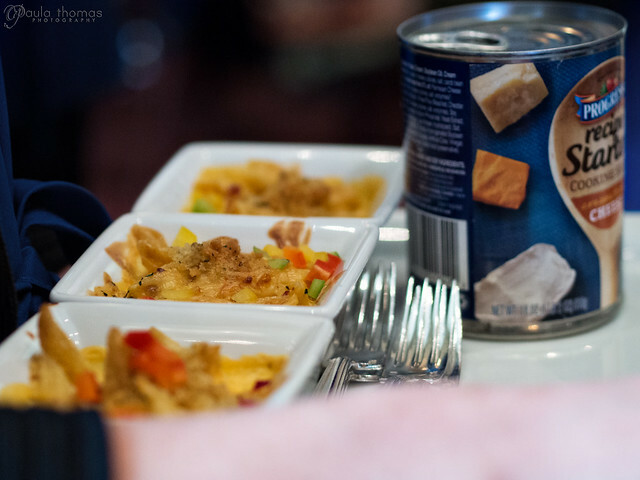 Progresso was there with some new sauces. They had a yummy mac n cheese made with their cheese starter sauce and a pulled pork sandwich made with a tomato based starter sauce. The best food of the night though was the cold smoked copper river salmon. 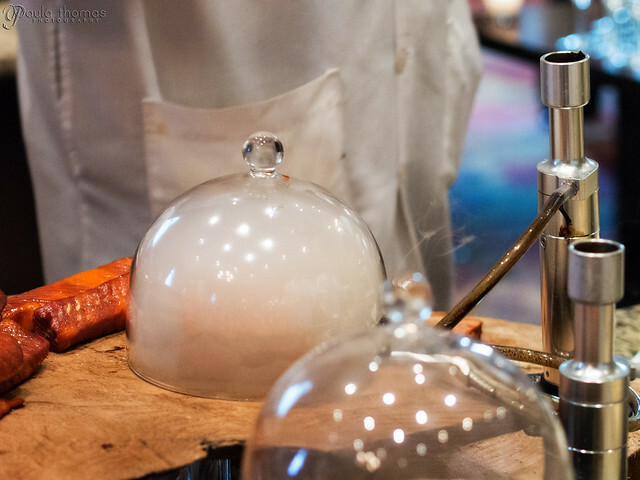 And they were smoking it right on the table using this domed smoking contraption. I overheard someone say they don't even like salmon but they liked this stuff. That is saying something.